misendeavours of a chronic bitchface: I amsterdam! Decided that I have procrastinated enough, and before enough time has passed that the post becomes absurdly out of date, I am finally going blog about my pre-sem travel to Amsterdam, Stockholm and Copenhagen. Too many photos, so I'm only going to post some choice ones. We survived the long and arduous ordeal that was the flight to Amsterdam, which entailed us stopping over twice, once at Sri Lanka to pick up passengers followed by a transit flight at Dubai. 3 takeoffs and 3 landings just to get to our destination. But the flight from Dubai to Amsterdam was AWESOME because kinkit, iven and I got bumped up to business class!!! The real test began after we had reached Amsterdam and had to drag all 30+ kg of our luggage to the hostel. Thank goodness for the convenient location of the hotel which made that ordeal that bit less painful. Reached the hotel at about 4+ and by the time we could do anything it was already 5pm. Luckily the skies turn dark only at about 10 pm so we had plenty of time to explore the area around the hotel. So the remainder of the day was spent just walking around doing ‘urban’ study of the place, basically snapping touristy pretentious photos that are tumblr worthy. Of course we had to make a trip to the infamous red-light district which I was mighty excited to visit. VICE, VICE EVERYWHERE. That was a pretty harrowing experience I must say. The prostitutes had a personal window where they stood making sultry poses at the passers-by in the hope of a paying customer, as opposed to the many gawking men and women that passed them by. The bed can be seen right in the window, and when they were in business, a mere red curtain would be drawn. The worst thing happened thereafter. Not having slept a lot on the plane to Amsterdam, we were all tired and jetlagged, but we had to choose this utmost inopportune time to get lost on the streets of Amsterdam. We walked around, trying our best to navigate the way back to the hotel on foot but it was only a good 2 hours later before we reached. All in all we covered about 15-20km on foot. I had to throw away my pair of shoes as they had fallen apart from the sheer intensity of the journey. Ah, beige ballet flats, you have served me well. I will not forget your kindness. So we took a train to see the beautiful windmills of Amsterdam. I was slightly disappointed that it wasn’t cold because my luggage was packed to the brim with jackets as I had obviously anticipated lower temperatures. It was an awesome experience and I’m so glad that I didn’t allow myself to be talked out of it. Took the train in the wrong direction at first and got super lost, but then we accidentally landed at a station which had some interesting buildings, so that was good. The weather was really weird. It was really sunny but it was chilly because of the wind. It was rather difficult to decide what to wear in this case. Thank goodness for leggings. Walked around the entire Zaanse Schans for half a day in the heat. After a while the windmills started to get stale and we turned to looking at farm animals instead. The people of the Netherlands are really friendly, and many people stopped to talk to us about where we were from and where we were going. Pretty vast difference from people in Singapore where people don’t talk to you until they’re asking you for directions. Highlight of the day was taking retarded pictures in giant wooden clogs despite the judgement of the people around. Being a tourist is pretty awesome. So basically, nothing much to say about it except: pretty scenery, cute windmills, giant clog and yangguang face. Literally. Because it was scorching hot. We proceeded to the main shopping area to have shoarma for dinner, which was mighty tasty and filling! Joe got super smashed by the marijuana and passed out on the bed while the rest of us went to sit by the I AMSTERDAM installation while eating stroopwaffles and drinking heineken. 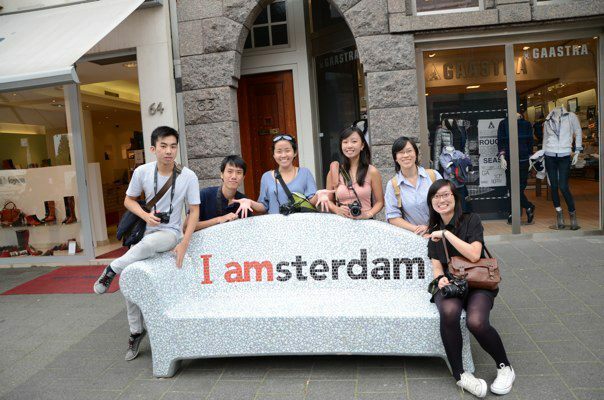 Went to the Van Gogh Museum with Iven and Suiying and Sze Ying as the rest had to make their way to Delft to get the hostel key. The building itself was vastly underwhelming, and the works kind of got boring after a while and I tired of scrutinizing the paintings amidst the large crowd. But it was rather interesting while it lasted! Walked back to the shopping area to have 5euro pasta! It was delicious. Proceeded to do various other touristy things such as souvenir shopping, shopping and taking pretentious photos. Somehow we ended up in Vondelpark eating cherry tomatoes, which has been the recent addiction for me. Delightful little morsels they are. Rushed back to the hotel to pack our bags before heading to Delft to meet the rest. The best thing about trams in these cities is that it’s incredibly easy to evade payment, because there are so many entrances to the tram and the driver sits all the way at the front. He also hardly bothers whether you pay up or not, so that was good for the pocket. Took a taxi to the hostel where we stayed. SO jealous of their dorm room which was spacious and clean and had internet and a nice cute little armchair. We however had to sleep on the floor in our sleeping bags which resulted in a little bit of grumpiness in the morning. Walked all the way to TUDelft from the hostel, which was an unexpectedly long way. Our visit to the University coincided with their Architecture camp, which was cool. Tried to steal one of their shirts but we were afraid that we'd get thrown out. Visited the studio which is OMG, so so so so awesome compared to the tiny facilities we have back in NUS. Had a pathetic lunch there before heading off to see some cathedrals nearby. Quickly packed our bags before taking the train back to Amsterdam, after which Suiying and I returned to the hotel to pack the rest of our luggage and chill out for a while. Decided that we should just meet the guys straight at the airport, so after repacking our possessions we went out gallivanting and ended up eating hot dogs on the grass in Vondelpark. It is incredible how the Dutch people spend so much of their time lounging around on the grass and smoking weed. Had a short 2 hour flight to Stockholm!! Sweden is incredibly nice and peaceful, and the weather was pleasant and bearably cold. The City Backpacker’s Hostel was all sorts of awesome. Super clean, well lit and spacious and has lots of quaint common areas. I really enjoyed my stay there! Too bad for the people that shared a room with us, though. The rustling of the plastic bags in our luggage must have been pretty damn annoying, especially when we return in the middle of the night.